I live at the Shedd. Most lobsters are green or brown. Note: This blue lobster, a resident of the Shedd Aquarium in Chicago, is the result of a 1 in 2 million chance of genetic mutation. For more on this beauty, watch the video. This entry was posted in Uncategorized and tagged Chicago, Haiku, lobster, Shedd Aquarium. Bookmark the permalink. Goodness, look at that fellow! He looks super – too good to eat! He’s probably wondering what all the fuss is about! All those people staring at him through the glass and snapping his photo with their phones. Thanks, Cindy — glad you enjoyed meeting him! Haha! I loved that the reporter wanted to know what would happen if he cooked the poor thing – beast!! I think I’d like being blue, too. Or maybe green. But I guess it wouldn’t be too much fun if you were a 1 in 2 million blue (or green), right??! Thanks, Suzi. He surely is! Thank you, John. I bet he doesn’t even have a clue as to how beautiful he is! Wow. A first for me, Debbie. Cool! Me, too, Audrey. 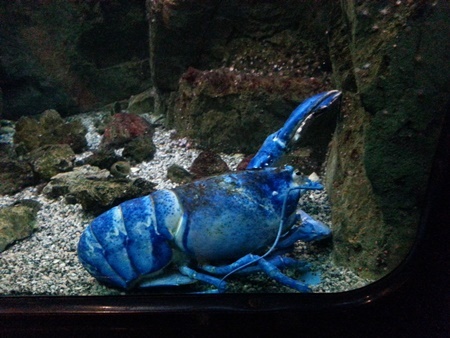 I’d never even heard of a blue lobster, much less seen one! My Mom is in town and we had Lobster for dinner tonight. I’m feeling a bit guilty :-D. Not much cooler than this lobster that is for sure! Well, at least you didn’t climb into “blue’s tank” and feast on him, huh? And tell your dear mom ‘hi’ for me — it’s her job to spoil you and Cole, you know! Thanks, glad you liked him! My heavens! I’ve never heard of such a thing — but of course, I don’t hang around many lobster traps! I’m trying to remember: when lobsters are cooked, they turn bright red, or at least reddish. I wonder…. No, we just can’t even contemplate such a thing. Experimenting to see if he turned red like most lobsters would leave all of his fans blue! So true. Do you remember those hard candies that used to turn different colors in your mouth as you sucked on them? Maybe a blue lobster would do that, too! But you’re right — they’re so rare that the thought of dropping one into a pot of boiling water is, well, unthinkable!! Debbie, that is the COOLEST thing!!!!! I watched the video clip, WOW…a blue lobster is one in TWO MILLION!!! I bet he/she feels VERY special – ha! P.S. My brother is up from Florida, so I have not been online much. We haven’t seen each other in 4 years, so it’s been great to spend time with each other. Enjoy your visit, Ron. I’m sure your brother welcomes not only seeing YOU but also your Fall colors and experiencing some cooler weather! Love your lobster Haiku! And love the blue lobster! Fascinating stuff! Thanks, Tee. Glad you enjoyed them both!! What a beauty! I never knew lobsters could be blue, very interesting that they lack a protein and can turn blue or orange. Great haiku also. It just goes to show you that there is so much beauty under the sea, but I would never have the nerve to dive! You and me, too! I’m definitely NOT a water person, ha! Maybe he can join the Blue man group LOL! As long as he can stay under water, I bet he’d enjoy it!! Well Debbie, perhaps it’s time for a stake out so you can get a picture of that magnificent crab! I can’t wait to see it!